It is once again that time of year in Derby City (aka Louisville) to share the mystical lore of the mint julep. After all, few drinks are held in such high esteem that they merit their own elegant namesake vessels. Julep cups began to be made before the drink was invented, however, and originally appear in period inventories as tumblers or beakers, terms by which they are still known more generically today. 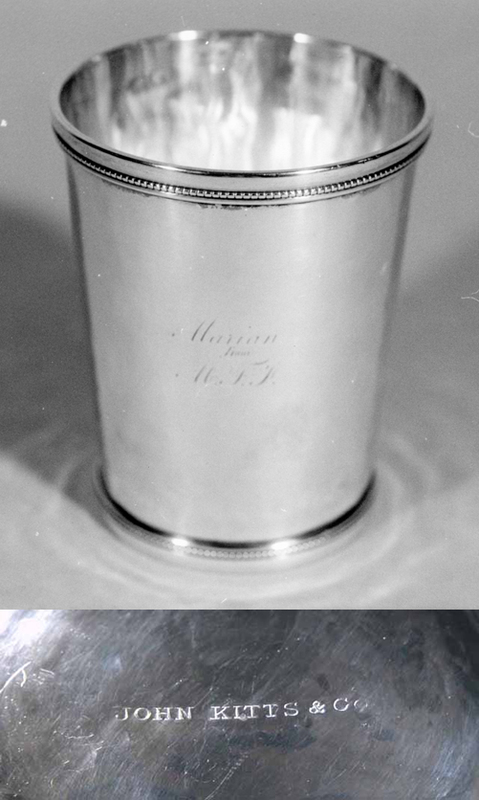 The silver julep cup has long been a symbol of achievement and prestige popular throughout the South. For more than two centuries Kentuckians have given, received, and used them as they were intended at special events, from ceremonial family gatherings such as christenings and weddings, to public contests at local and state fairs. And, of course, at the state’s favorite pastime, horse racing. As far back as 1816 the Kentucky Gazette noted that julep cups had been awarded as prizes at horse races in the Commonwealth. The julep cup (i.e., tumbler or beaker) is a classic American silver form. 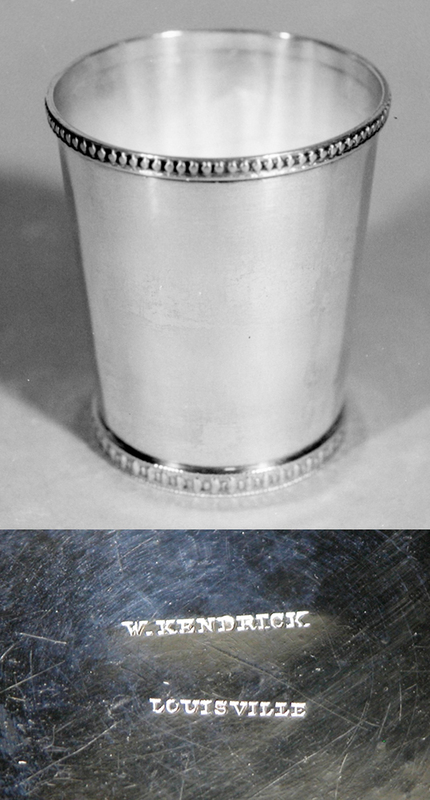 Julep cups were made in many Southern states, and each often developed its own unique style. In Kentucky, the distinctive straight body lines with graceful moldings at base and rim may trace its origins to silversmiths Asa Blanchard of Lexington and William and Archibald Cooper of Louisville. 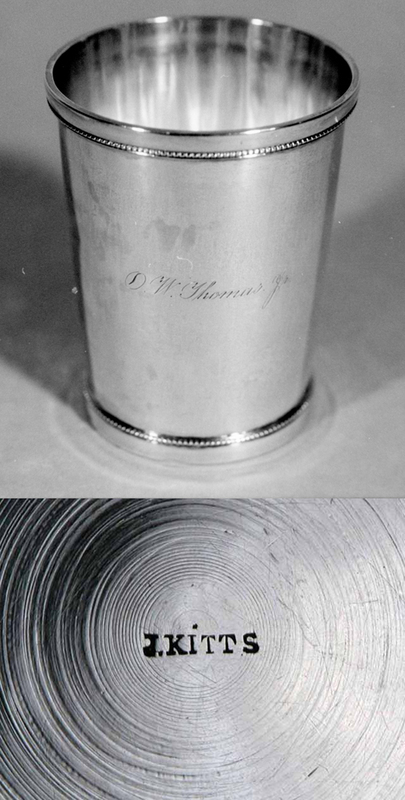 There are currently twenty-three julep cups (tumblers) on the KOAR website; the first shown here is credited to William Kendrick and the rest to John Kitts, both of whom worked in Louisville. Kendrick married Maria Schwing, daughter of Louisville goldsmith and jeweler John Godfried Schwing, in 1832, and was listed as a jeweler on both the 1850 and the 1870 census. He moved his store to Third Street in 1855, where he stayed fifteen years before moving in 1870 to 114 West Main Street, on the south side just east of the National Hotel. In 1873, he went into partnership with his son, William Carnes Kendrick (1852-1938), as the firm of William Kendrick & Son. In 1875 their shop moved to 336 Fourth Street, on the west side between Market and Jefferson, then as business increased moved again to more spacious quarters at 110 Fourth Street in 1877; on both occasions newspaper articles in Louisville’s Courier-]ournal noted the firm’s success. By the time of William Kendrick’s death in 1880, he had become one of Louisville’s most prosperous and respected merchants. A julep is generally defined as a sweet drink, and from the French can be traced back to the Persian term gulab, meaning rose water, or a drink made from water and rose petals. The mint julep originated in the southern United States during the early to mid eighteenth century, most likely in Maryland, Virginia, and North Carolina. The first mention of it in print seems to be from an 1803 book published in London, England, where John Davis described the mint julep as “a dram of spirituous liquor that has mint steeped in it, taken by Virginians of a morning.” U.S. Senator Henry Clay of Kentucky introduced the mint julep to Washington, D.C., at the Round Robin Bar in the famous Willard Hotel. Some maintain it is the mint that has caused most of the trouble, whether the fresh mint should be muddled (crushed) in preparation so that essential oils and juices can be released into the mixture to intensify its flavor, as is usually preferred in Kentucky, or the leaves should be left to slide unmolested into the cup. Most would agree that only the freshest mint, and of that just the smallest tenderest leaves, should be used. A few sprigs of mint should also top the ice so this will be the first aroma encountered by the partaker. Although bourbon is now the preferred spirit in mint juleps almost everywhere, the first mint juleps were made with rum, rye whiskey, genever (an aged gin) and other available spirits. But by the early eighteenth century farmers were using stills to make corn whiskey along the American frontier that would become the Commonwealth of Kentucky. Bourbon County, a vast area still part of western Virginia when founded in 1785, was named after the French royal House of Bourbon, who had helped the United States defeat the British in the Revolutionary War. After Kentucky was admitted to the Union in 1792 Bourbon County was repeatedly subdivided, eventually becoming thirty-four modern day counties, but the entire region continued to be called Old Bourbon for many decades. Kentucky-made products exported from this area, such as corn whiskey, were shipped out through the Ohio River port of Limestone (now Maysville) with “Old Bourbon” stenciled on barrels to indicate their point of origin. In Bourbon, Straight: The Uncut and Unfiltered Story of American Whiskey, Charles K. Cowdery points out that “Old Bourbon whiskey was different because it was the first corn whiskey most people had ever tasted.” After about 1840 this was shortened to just “Bourbon”, the identity Kentucky corn whiskey soon became known by the world-over. Local distillers attribute much of the unique nature of Kentucky bourbon to its geography, the limestone bedrock under the Blue Grass region formed by fossils of shelled crustaceans that inhabited the shallow tropical ocean covering this area in prehistoric times. As water filters through the limestone minerals are released into the ground soil, enriching crop yield (including the corn as well as the distinctive bluegrass on which thoroughbred foals graze) and providing nutrients for yeast, which is added to the corn mash to convert sugars into alcohol during the fermentation process. Limestone also breaks down over time to form massive caves like central Kentucky’s Mammoth Caves, the longest cave system in the world. 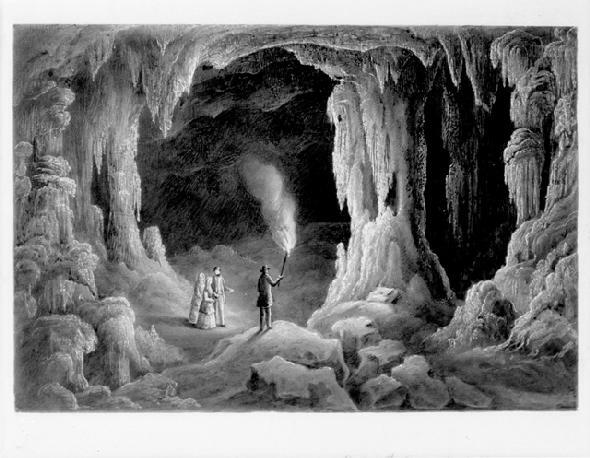 The springs that flow from these underground caverns provide plentiful sources of pure iron-free water. Each distillery has its own sour mash culture and bourbon recipe, a closely guarded secret by the master distiller. Experimentation and refinement with various ratios of ingredients, subtleties in the distillation process, and lengths of aging time yield different flavors of bourbons. Distilleries located in the Kentucky Blue Grass region make about nine out of every ten bottles of bourbon, although it may be produced anywhere in the United States where it is legal to distill spirits. The Kentucky Distillers’ Association estimates that the state has 4.9 million barrels of bourbon currently aging, a figure that exceeds the state’s population. You are currently browsing the archives for the Kentucky drawings category.